Preparations are already well underway for numerous events planned next year to commemorate the 400th anniversary of the King James or Authorized Version of the Bible. Compared to celebrations a century ago, the current round will probably be muted, at least somewhat. In 1911, leading public figures of all kinds competed vigorously to outdo each other in praising this translation for its beneficial impact on the English-speaking world. The word came from the White House when William Howard Taft declared that the KJV was "the Bible of our American forefathers. Its classic English has given shape to American literature. Its spirit has influenced American ideals in life and laws and government." The day after President Taft released this statement, The New York Times editorialized that, while it probably was time to move on to newer translations, nonetheless the then 300-year-old version still deserved to be considered "the bud of the herb of civilization, the spring of a new day, the trumpet of a prophecy." Similar encomia about the positive influence of the KJV showered down from all sides, and not only from religious sources. The general-circulation Century Magazine, for example, hailed the KJV as "the text-book of a race of world-wide relations and influence … not only a great work of literature but a historical document of greater importance in the national life of the English-speaking peoples than Magna Carta … this great textbook of English faith, speech, and morals." Among the most extravagant voices praising the KJV was former president Theodore Roosevelt. As he saw it, "No other book of any kind ever written in English—perhaps no other book ever written in any other tongue—has ever so affected the whole life of a people as this authorized version of the Scriptures has affected the life of the English-speaking peoples." This time around, in 2011, praise for the KJV will doubtless reflect circumstances that are considerably different from what prevailed in 1911—many more translations actively in use, much more powerful media competing for public attention, much greater religious (and anti-religious) pluralism in society as a whole. But we will in all likelihood continue to hear a great deal about the "influence," "effects," or "impact" of Scripture. Precisely such talk is the spur that recently brought into being the intriguing collection of essays edited by James Bielo, a visiting professor of anthropology at Miami University in Ohio, and gathered under the title The Social Life of Scriptures: Cross-Cultural Perspectives on Biblicism.The premise of the book is well-stated by one of its contributors: Although "the Bible is often said to be the most influential book in history, … how and why the Bible has had such influence is as yet rather poorly understood." The authors realize, of course, that much theological discourse has addressed the question of influence. They, by contrast, are suggesting that "the social and psychological processes affecting the way these texts are perceived, understood, and deployed have not been much investigated." The effort to assess those processes deserves serious consideration even from—maybe especially from—Christian believers who insist that more than just these processes are in play when humans turn to the Book. Although valid criticisms can be made of some of what appears in The Social Life of Scriptures, its appearance reflects three positive developments. First is the work of Vincent Wimbush, the editor of the series at Rutgers University Press, Signifying (on) Scriptures, in which this volume appears. Wimbush has been a pioneer in addressing the semiotics, social uses, and political effects of the Bible, especially as the editor of a landmark collection of essays published in 2001, African Americans and the Bible: Sacred Text and Social Textures. Second is the association of several of the book's authors with a relatively new movement called "the anthropology of Christianity." 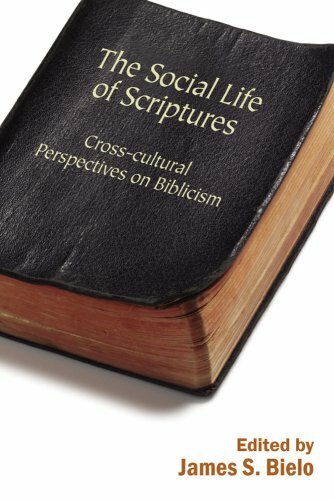 As exemplified best in a book series under that name from the University of California Press, the effort tries to study the world's newer expressions of Christianity with the same empathy and non-judgmental curiosity that anthropologists have historically brought to their examination of primal or indigenous religions. Joel Robbins, who edits the California series, has demonstrated the potential of this approach with his own book on a newer Christian community in Papua New Guinea and defended it in a number of programmatic statements. This new domain of anthropological study reflects a third factor behind The Social Life of Scriptures, this one ideological. After the foundations were laid by Frazer, Durkheim, and Malinowski, anthropologists long accepted the myth of scientific objectivity as their guiding principle for studying "primitive" societies—while at the same time proceeding as if the Christian heritage of the West was an intellectual and moral incubus to be subverted as a routine matter of course. Self-consciousness about the fraudulence of this posture (never adequate even in terms of the evolution of anthropology as a discipline) has grown gradually, with a major boost from the work of Mary Douglas, who used her Catholic faith to heighten anthropological acumen, and with a host of more recent figures who have subjected the scientistic myths of inevitable secularization to withering scrutiny.